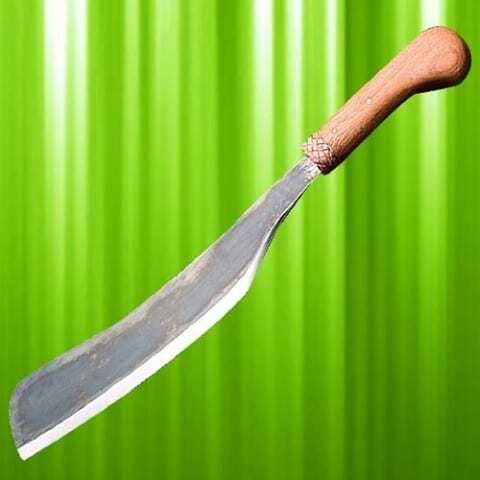 Modelled on a machete brought back from the Vietnam War as a souvenir. Crude and field-ready to chop whatever – perfect for the purpose. Made from hand forged high carbon steel with a very sharp 55cm x 5cm blade with a blued finish. Close grain hardwood handle held in place with two brass pins. Overall length 46cm. Weight 0.5kg. 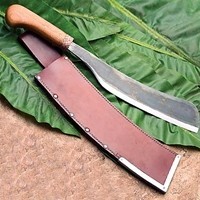 Sheath specifically designed for the machete and not based on any original. Made from top grain leather with steeel rivets and a steel blade protector at the stress points. Fits belts up to 6cm wide.